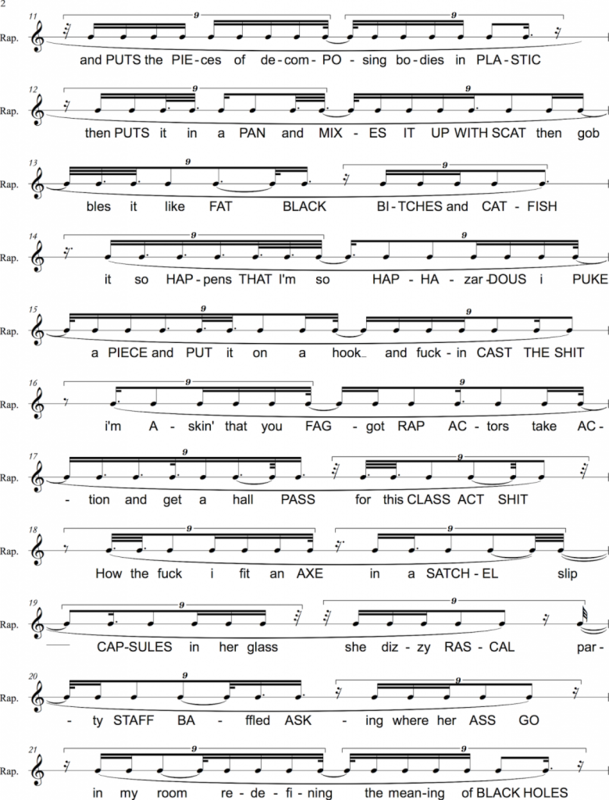 There is no standard way to notate rap. Western music notation fails to account for non-semitonal pitch movements, and it’s this failing that has led to some to disparage rap. (In fact, I’ve tried to rectify this by using a modified MIDI piano roll that can move in smaller amounts than semitones. 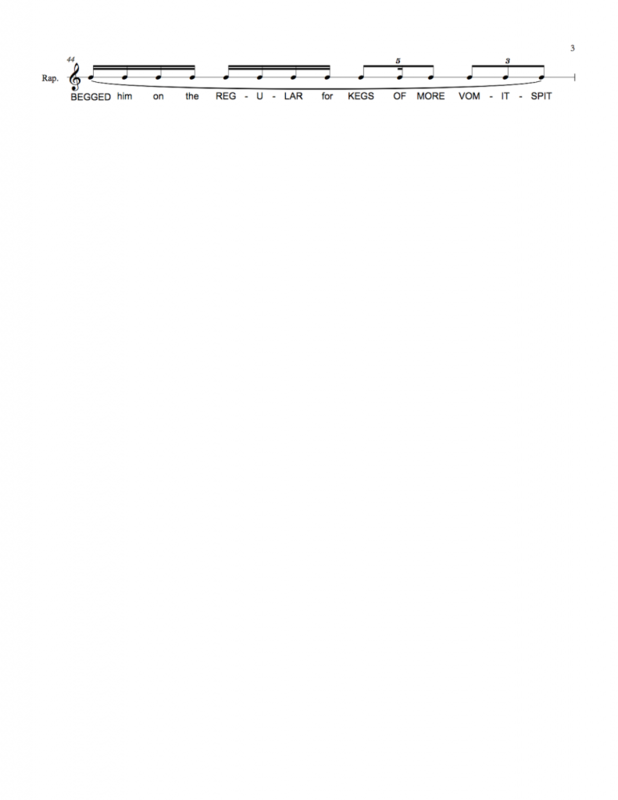 I combined this notation with an Eminem song in this video here.) 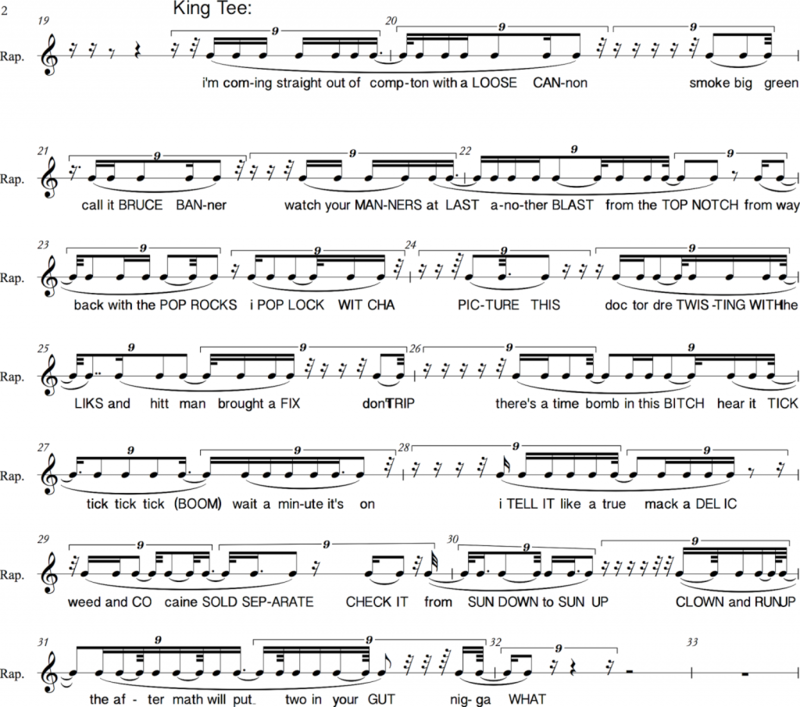 For this reason, I’ve notated the rhythms all on a single staff line, to also emphasize rap’s percussive nature. The slurs, far from indicating articulation like legato, instead show where semantic meaning (sentences) stops and ends. Rhymes are capitalized. The clef is included not to indicate melodic range, but to emphasize the melodic nature of rap, which doesn’t always happen. 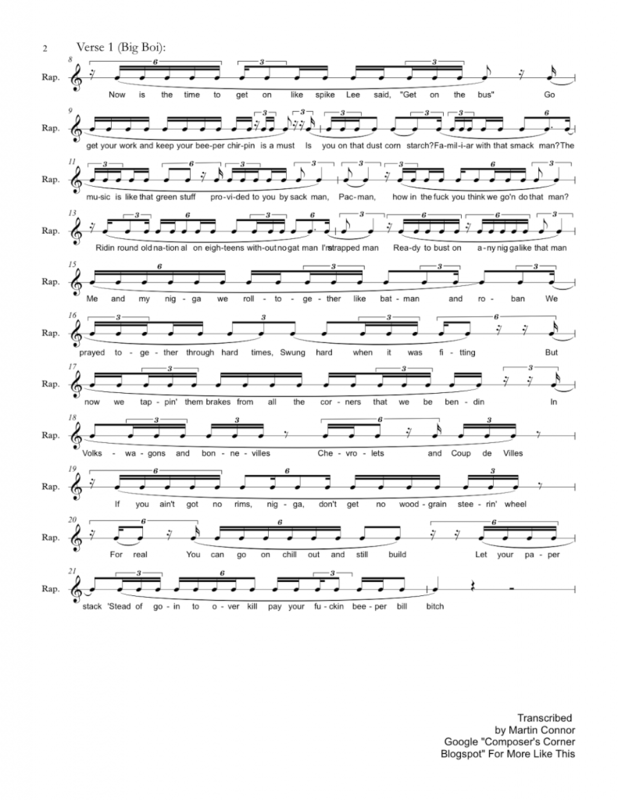 Some of these rhythms, understandably, mean nothing to people who view them. That is, they can’t be performed by people who see them, for instance, as by people who see more standard scores, with straightforward 16th notes, for instance. This informs my approach. 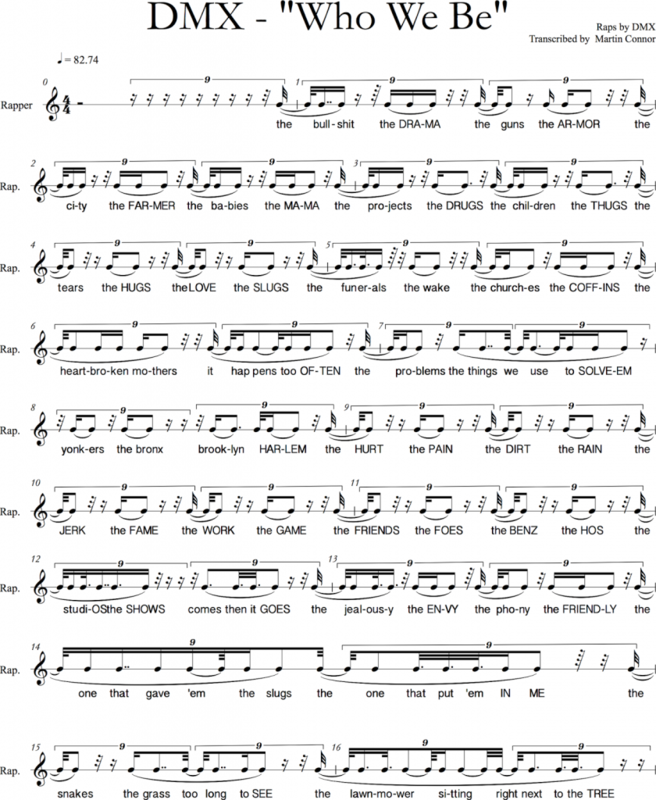 I have notated the rhythms exactly; other people round them off, such as Kyle Adams in his “On Metric Techniques Of Flow.” However, I don’t believe rapper’s rhythms are swung. They are too intricate for that; to reduce them with a legend would give no information beyond how many notes there are too a bar. They’re not swung because they don’t relate in a straightforward manner to a bass, as they do in a shuffle rhythm. I’ve used noctuplet groupings not to reflect how rappers are counting them, but because it’s easiest to notate them in this manner, because it affords so many different types of rhythmic subdivisions. This means I can use noctuplet groupings for every bar, which keeps the music nicer. 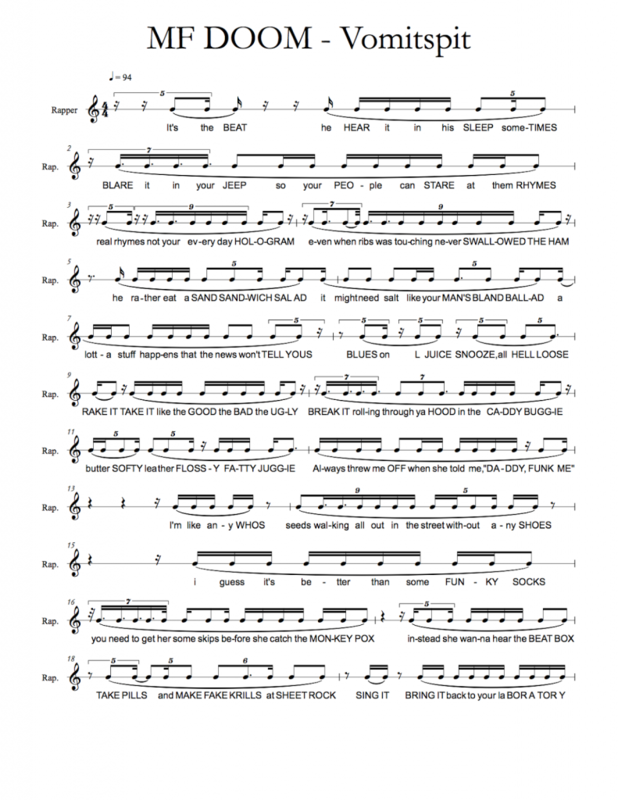 One drawback is that, just reading this music, it’s harder to appreciate that every rhythm is different. Game’s sound nothing like DMX’s, and DMX’s sound nothing like Time Bomb, who doesn’t sound like Hittman, etc. I’ve used note rhythms not to indicate the length of how long the rapper pronounces the words for, but to make the music easier to read. 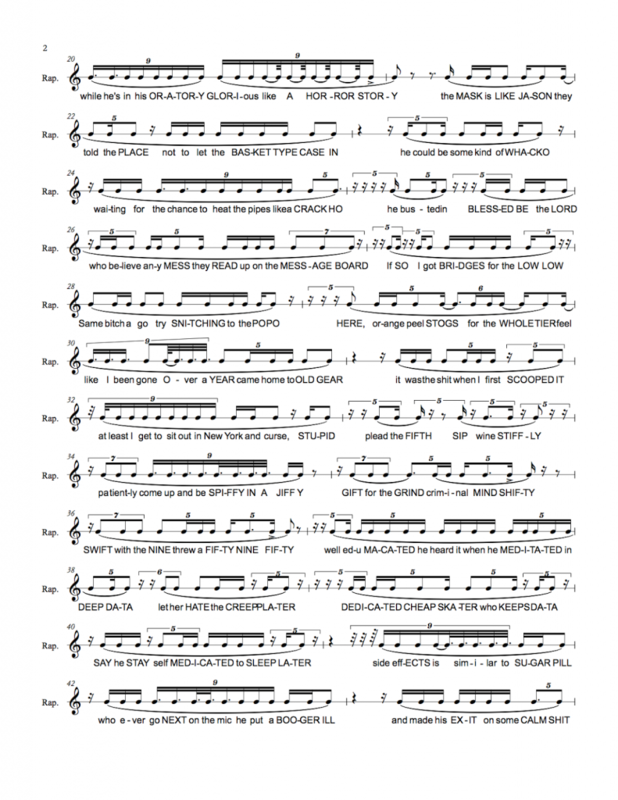 These rhythms are really unbelievable. I promise they’re true though. Earl Sweatshirt’s alone took me 20 hours. I also checked them by overlaying video of the actual recorded music being played over a video of Sibelius with the notation being played. 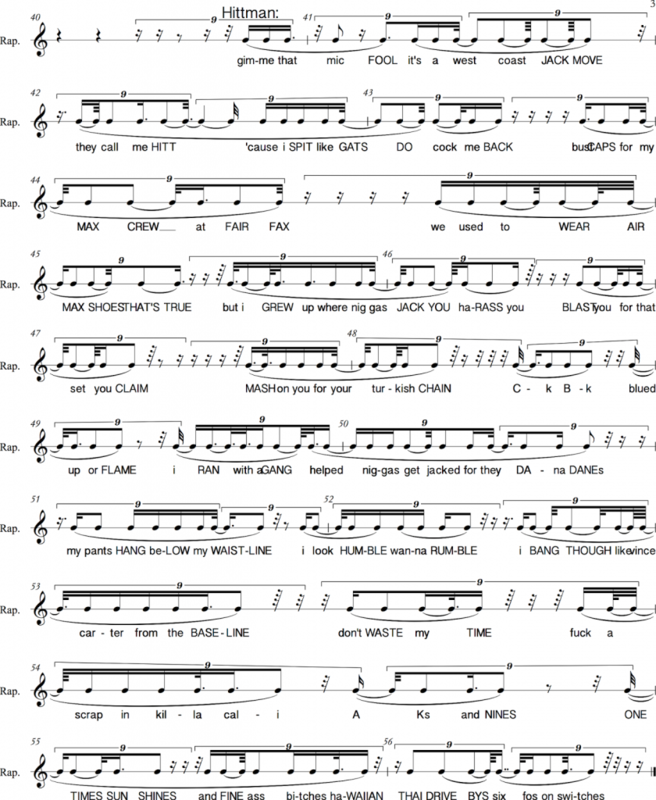 Without further ado, these are my transcriptions, with links to each song. If people ask, I can put up video of Sibelius playing these rhythms, overlaid with the actual music. The six songs are “Some L.A. Niggaz,” by Dr. Dre, “Earl,” by Earl Sweatshirt, “Aquemini,” by OutKast, “Vomitspit,” by MF DOOM, “How We Do,” by Game, and “Who We Be,” by DMX. I’ve also offered thoughts on their rhythms sometimes. Here we go! “Some L.A. Niggaz,” – Dr. Dre, from Chronic: 2001; notated below are verses from Hittman, King Tee, and Time Bomb; verses from Defari and Xzibit were omitted. Notice how they almost without fail avoid the 3rd beat, which is noticeably missing in the backbeat. Notice how Hittman is constantly starting and stopping his sentences in different placs. Notice how the sentences run across the barlines, which rarely happens in rap. Notice King Tee’s long pauses. Notice how Game is constantly changing the final note to fall on the beat, and then to fall syncopated off it. Accent marks with < are on the beat; notes with a tenuto are off the beat. Notice how many times he repeats a 3-note rhythmic figure. Notice how this goes throughout his whole verse, and into other verses as well. Notice that rhymes on the vowel sound “-uh” are all we hear for the entire opening 16 bars. Notice his really short sentences, and lack of full sentences. Notice how he’s constantly repeating his 2-note rhythm that falls on the beat. Notice that he lists just nouns, not verbs. Notice how few notes there are. Notice how small his rhythmic subdivisions get sometimes. Notice how he falls behind the beat at places, and places tons of small rhythms to catch up to it. Notice how slow his rhythms are. Notice how lazy they are. Notice how long his phrases (sentences, indicated by slurs) are. Notice his crazily long rhymes. Notice how many different types of rhythmic subdivisions he uses. Notice his dancing around the downbeat constantly. Notice how fast his rhythms are, especially in a song with this tempo. 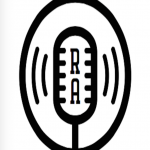 ← Rap Analysis – Who Is More Versatile, Black Thought Or Waka Flocka Flame?